When it comes to my birds, many of the paintings and photos are from winter, when the birds are simply easier to see, but also one of my favorite seasons for painting and photography. Last year I decided to make up two sets of cards for the holidays—and possibly beyond—from the paintings and photos that received the most comments. Knowing that many of my readers are also avian fans and feeders, I’m sharing them here today. I truly love winter paintings because the light is wonderful without the shadows from trees, the reflections from the snow illuminating shadowed areas with soft purples and blues, and the patterns made by bare branches are mesmerizing. This set of four paintings of birds are ones I’d done “from life”, actually standing at a window inside or at my back door rather than literally en plein air, but I wanted to catch that moment of light and color. I also offer these images as art prints. Please ask! Find these cards in my Etsy shop. 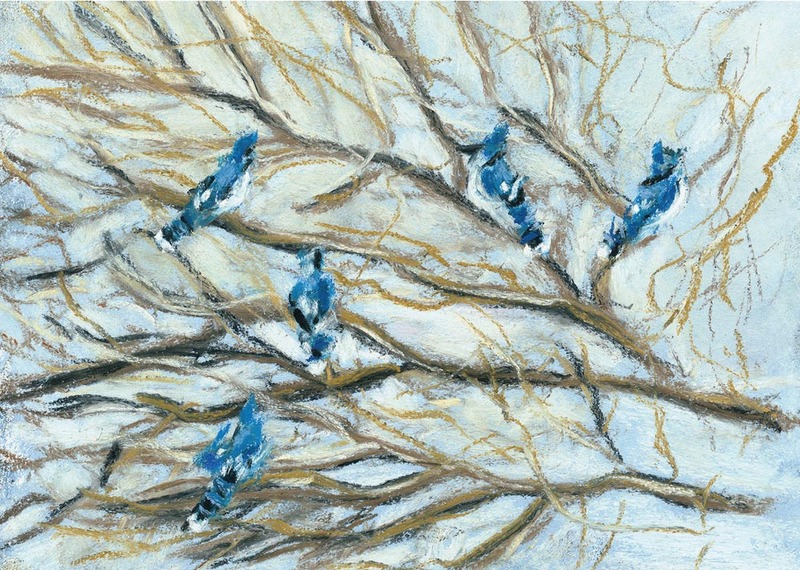 Above is “Jammin’ Jay Blues”, my impression of a bunch of noisy blue jays making a racket in the bare branches of the mulberry. In the winter light, their blue feathers have an extra glow that I don’t notice in summer, and between the color and the sound they occasionally fill my backyard with what feels like a celebratory parade, when all they are celebrating is the sliced apples I’ve stuck on twigs in the tree. 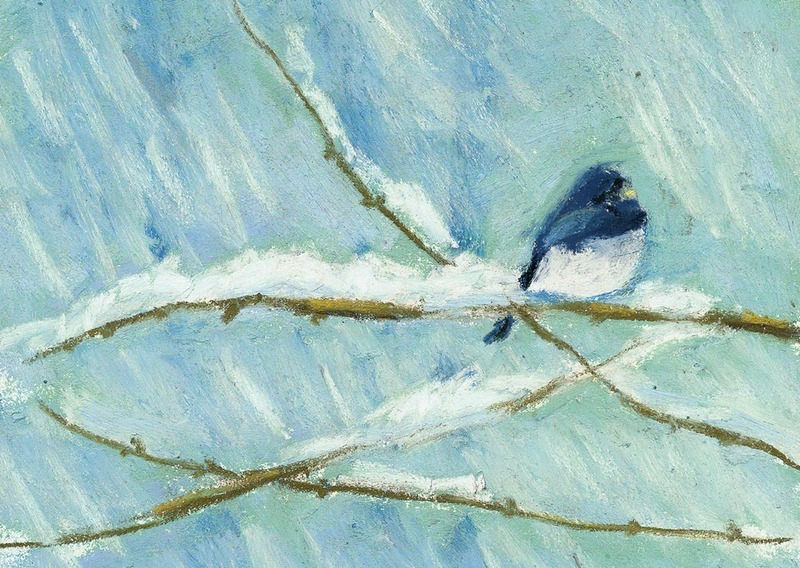 Below is “Snow Bird”, a play on the common name for a dark-eyed junco, as it clings to along branch of the forsythia in heavy snowfall, apparently living up to its name. They appear in my backyard each year in October and stay until April, and I love their simple little silhouettes, tiny rounded bodies, short beaks and tails, and that white spot on their bellies that looks as if they’d been dipped in white paint before they left the factory. 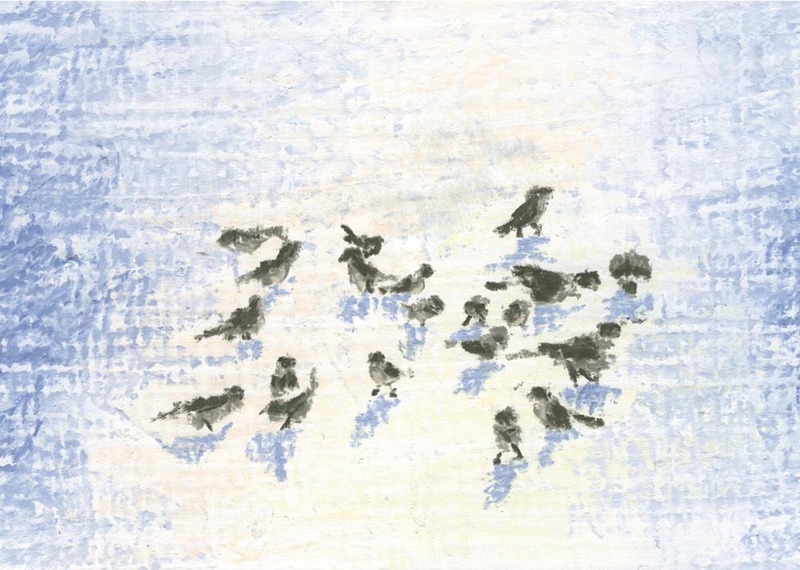 This is “Birds in Snow”, inspired by the sparrows and doves that feed on the ground under the feeder outside my front door. To one side of the feeder is a huge spruce, providing cover and safety for many, many birds, and watching them twittering on the branches, then dropping down for seeds one by one and pecking around in the snow in a big crowd, then suddenly all of them flapping back up into the spruce as if signaled by something only to begin the process again is like watching waves on the beach. And here is “Accent”, a single cardinal in the branches and brambles touched with snow at the end of the yard. This is the “safe spot” for birds and small animals as I’ve let the wild grapevines, raspberries and blackberries and Roses of Sharon grow into a dense tangled mass which is excellent protection from predators and I place a seed feeder and suet feeder into the mess each autumn. A heavy snowfall which layers each branch with white and the play of light and shadow in the mass of branches creates one of nature’s most lovely patterns. Where most of my drawing surfaces have some texture, for this one I added marble dust and grit and gave the surface a rough brushed appearance which turned out to be perfect for capturing the feeling of branches and snow. Inside, all cards say, “Wishing you warm thoughts and happy memories in this holiday season, and an astonishingly beautiful new year to come.” They are sold by the dozen, three cards of each design, with white envelopes. While I’m offering these cards for the holidays, they are wonderful all-purpose greeting cards as well and I’ll keep them available through spring in my Etsy shop. Click here to find them in my Etsy shop. 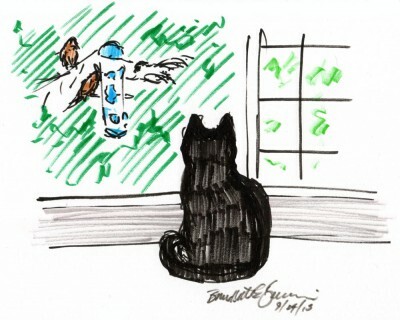 Mimi watches the birds, I sketch the birds, and I sketch Mimi! I designate four portrait certificates each year for donation to benefit animals, and also donate merchandise, prints of artwork and even originals to rescue and shelter benefits. If you are interested in a donation for your event, please email me with the details of your event and your organization. Or click here to open a sign up form in a new window (which seems to work better). 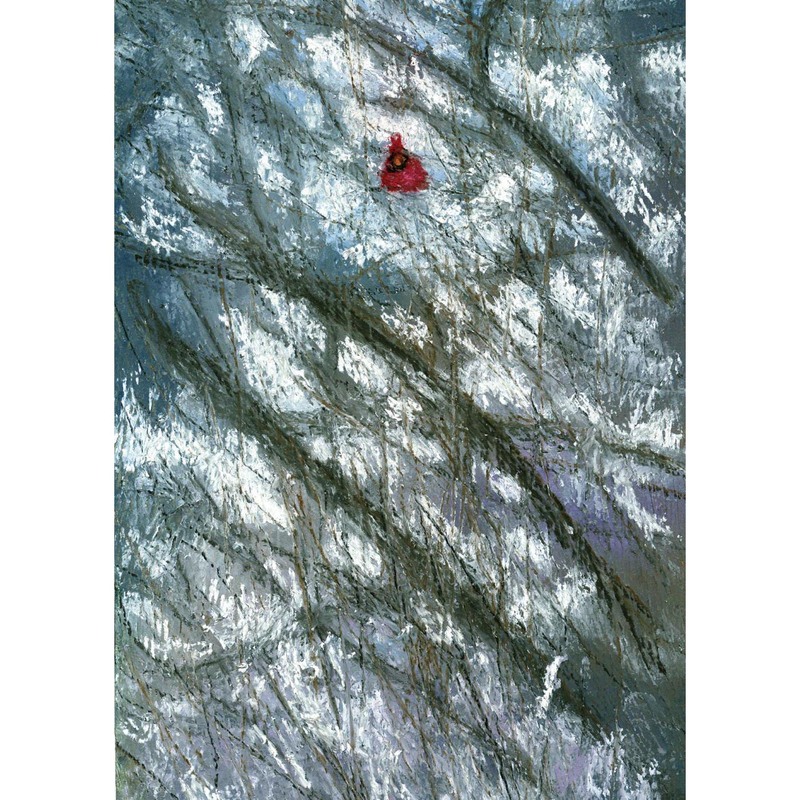 This entry was posted in greeting cards, nature artwork, wildlife art, wildlife merchandise and tagged avian art, backyard birds, bird art, bird paintings, birds, greeting cards, wild birds on January 15, 2015 by Bernadette.